Fill in the form below and one of our loyalty program experts will contact you. They will answer your questions and demonstrate the platform so you can see how AirLoop will benefit your business. Did you know: 85% of customers said they are more likely to shop at a business that had a loyalty program over one that didn’t. See how our existing customers are leveraging the power of digital loyalty program to grow their customer base. No. There are no setup fees for start a digital loyalty program. Yes. You would require to get an iPad (running iOS 8+) or an Android tablet to run your digital loyalty program. What sort of tablet stand would I require? We recommend our customers to get TryTen Flip Stand to our customers. But you can use any stand that suits your needs. Yes. We charge you $0.05 per outgoing message. Once you setup your account you will have the option to purchase outgoing messaging credits from your control panel. Do my credits ever expire? No your credits never expire. 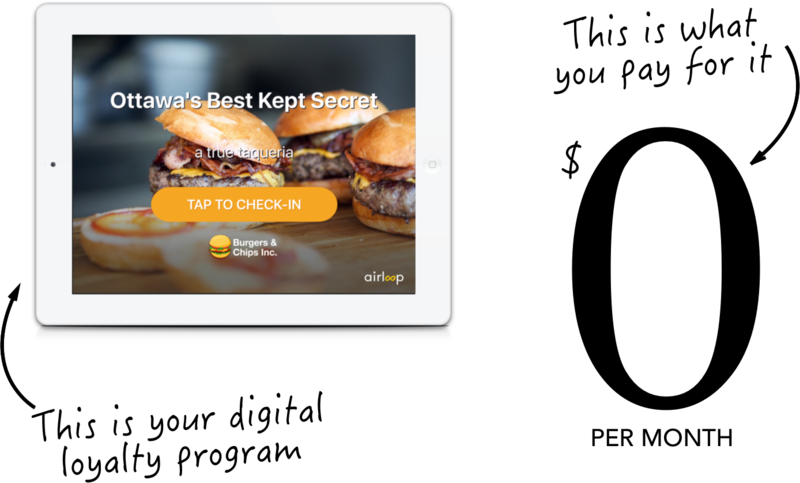 Yes, you will need a Wi-Fi connection to securely run the digital loyalty program. Yes. We use secure connections while transmitting data from and to your tablet device. Yes. You can completely customize your rewards program. You can even customize how many points each customer gets upon a check-in. We believe that every business should be able to run a sophisticated digital loyalty program that enables them to create better customer experiences. We also believe that we should only charge you once you have successfully on-boarded your customers and want to reach out to them for marketing. Interested? Ready to increase your business? Let us show you how AirLoop can help you grow your business. Set up a no obligation demo and our team member will walk you through our system.